I stopped in at Downtown Dogs N More of Algonquin a couple of weeks ago. Turned around and abruptly left. Why? The place was jammed! So last week I got there early enough to beat the crowd and now I know why it was so busy. I had their special, 2 dogs fries and a drink for 4 bucks. The dogs were great. The dogs were great. The home-made fries are excellent and we topped of the meal with chocolate dipped soft-serve cones. 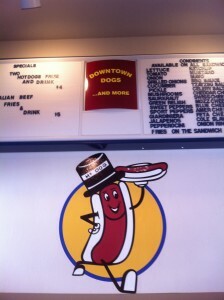 I’m looking forward to trying one of Downtown Dogs’ burgers. Eat in the restaurant or take your order to go.